There are big problems with medical research, as we have posted about many times in the past. A very significant part of the problem is health care research is very hard. There are all sorts of interactions that make conclusive results much more difficult than other areas. But failures in our practices also play a big role. Just poor statistical literacy is part of the problem (especially related to things like interactions, variability, correlation that isn’t evidence of causation…). Large incentives that encourage biased research results are a huge problem. He discovered that the range of errors being committed was astonishing: from what questions researchers posed, to how they set up the studies, to which patients they recruited for the studies, to which measurements they took, to how they analyzed the data, to how they presented their results, to how particular studies came to be published in medical journals. The systemic failure to do adequate long term studies once we approve drugs, practices and devices are also a big problem. Another problem is that medical research often doesn’t get the normal scientific inquiry check of confirmation research by other scientists. Related: Statistical Errors in Medical Studies – Medical Study Integrity (or Lack Thereof) – Contradictory Medical Studies (2007) – Does Diet Soda Result in Weight Gain? Scientific inquiry is aided by sensible application of statistical tools. I grew up around the best minds in applied statistics. 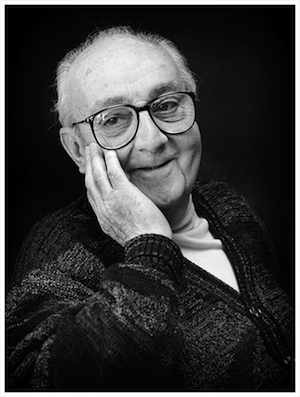 My father was an eminent applied statistican, and George Box (the person in the video) was often around our house (or we were at his). Together they wrote Statistics for Experimenters (along with Stu Hunter, not related to me) the bible for design of experiments (George holds up the 1st edition in the video). The video may be a bit confusing without at least a basic idea of factorial designed experiments. These introductory videos, by Stu Hunter, on Using Design of Experiments to Improve Results may help get you up to speed. This video looks at using fractional factorials to reduce the number of experiments needed when doing a multifactor experiment. I grew up understanding that the best way to experiment is by varying multiple factors at the same time. You learn much quicker than One Factor At a Time (OFAT), and you learn about interactions (which are mainly lost in OFAT). I am amazed to still hear scientists and engineers talk about OFAT as a sensible method or even as the required method, but I know many do think that way. To capture the interactions a full factorial requires an ever larger number of experimental runs to be complete. Assessing 4 factors requires 16 runs, 6 would require 64 and 8 would require 256. This can be expensive and time consuming. Obviously one method is to reduce the number of factors to experiment with. That is done (by having those knowledgable about the process include only those factors worth the effort), but if you still have, for example, 8 very important factors using a fractional factorial design can be very helpful. And as George Box says “What you will often find is that there will be redundant factors… and don’t forget about those redundant factors. Knowing that something doesn’t matter is almost as important as knowing what does.” If you learn a factor isn’t having an affect you may be able to save money. And you can eliminate varying that factor in future experiments. Reposted from my management blog. Randall Munroe illustrates RA Fisher’s point that you must think to draw reasonable conclusions from data. 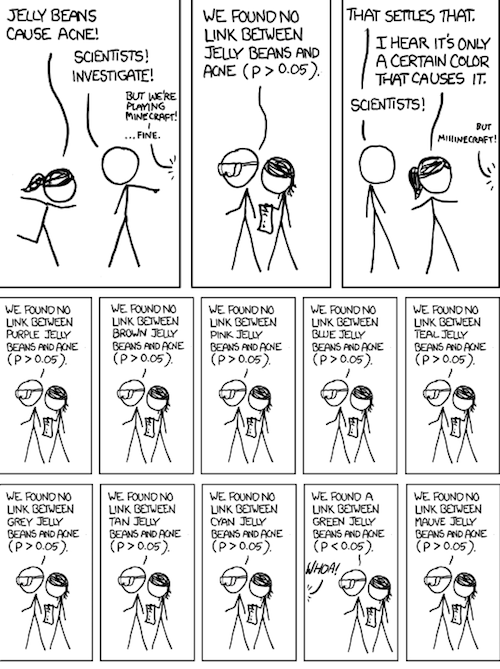 Click the image to see the full xkcd comic. The changes in cancer risk were all over the map: 39 percent found an increased risk, 33 percent found a decreased risk and 23 percent showed no clear evidence either way. The vast majority of those studies, Schoenfeld and Ioannidis found, showed really weak associations between the ingredient at hand and cancer risk. A full 80 percent of the studies had shown statistical relationships that were “weak or nominally significant,” as measured by the study’s P-values. Seventy-five percent of the studies purporting to show a higher cancer risk fell into this category, as did 76 percent of those showing a lower cancer risk. Sadly the evidence is often not very compelling but creates uncertainly in the public. Poorly communicated results and scientific illiteracy (both from publishers and the public) leads to more confusion than is necessary. Even with well done studies, good communication and a scientifically literate population nutrition and human health conclusion are more often questionable than they are clear. If a medical study seems too good to be true, it probably is, according to a new analysis. In a statistical analysis of nearly 230,000 trials compiled from a variety of disciplines, study results that claimed a “very large effect” rarely held up when other research teams tried to replicate them. The report should remind patients, physicians and policymakers not to give too much credence to small, early studies that show huge treatment effects, Ioannidis said. The Stanford professor chose to publish this paper in a closed science publication. But previously he published openly on: Why Most Published Research Findings Are False. Our instincts lead us to fear the unknown and immediate threats (probably so we can be ready to run – or maybe fight). But today the biggest risks to an untimely dealt are not lions, other people out to get us, or even just random infection. We have to adapt to the new risks by taking action to eat healthfully and exercise, in the same way we we have evolved to avoid becoming a meal for a hungry beast. Today the largest causes of death are heart disease and cancer (which account for more than 60% of the deaths causes by the top 10 leading causes of death). The next leading causes are non-infectious airways diseases, cerebrovascular diseases and accidents. Alzheimer’s, diabetes, nephropathies, pneumonia or influenza and suicide make of the rest of the top 10 leading causes. 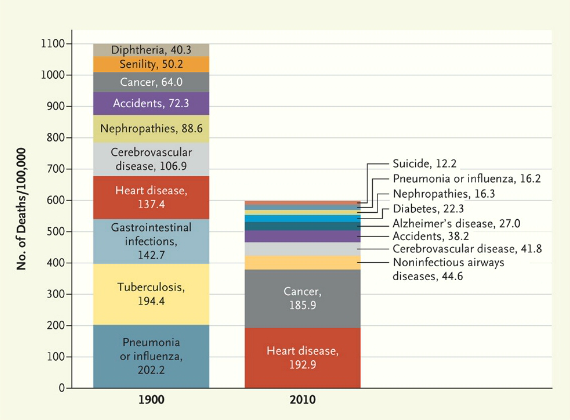 In 1900 Pneumonia or influenza and tuberculosis took as many lives (per 100,000 people) and cancer and heart disease take today. We have done well decreasing the incidents of death (fewer deaths per 100,000) by greatly reducing and nearly eliminating some causes of death (the 2 leading causes from 1900 are good examples). The largest comprehensive analysis of ClinicalTrials.gov finds that clinical trials are falling short of producing high-quality evidence needed to guide medical decision-making. The analysis, published today in the Journal of the American Medical Association, found the majority of clinical trials is small, and there are significant differences among methodical approaches, including randomizing, blinding and the use of data monitoring committees. This is a critical issue as medical studies continue to leave quite a bit to be desired. Even more importantly the failure to systemically study and share evidence of effectiveness once treatments are authorized leaves a great deal to be desired. On top of leaving quite a bit to be desired, the consequences are serious. If we make mistakes for example in how we date fossils it matters but it is unlikely to cause people their lives or health. Failure to adequately manage and analyze health care experiments may very well cost people their health or lives. “Our analysis raises questions about the best methods for generating evidence, as well as the capacity of the clinical trials enterprise to supply sufficient amounts of high quality evidence to ensure confidence in guideline recommendations,” said Robert Califf, MD, first author of the paper, vice chancellor for clinical research at Duke University Medical Center, and director of the Duke Translational Medicine Institute. The analysis was conducted by the Clinical Trials Transformation Initiative (CTTI), a public-private partnership founded by the Food and Drug Administration (FDA) and Duke. It extends the usability of the data in ClinicalTrials.gov for research by placing the data through September 27, 2010 into a database structured to facilitate aggregate analysis. Accessible from many platforms: Google App Engine, Apps Script (Google Spreadsheets), web & desktop apps, and command line. The Prediction API supports CSV formatted training data, up to 100M in size. Numeric or unstructured text can be sent as input features, and discrete categories (up to a few hundred different ones) can be provided as output labels. I have written about statistics, and various traps people often fall into when examining data before (Statistics Insights for Scientists and Engineers, Data Can’t Lie – But People Can be Fooled, Correlation is Not Causation, Simpson’s Paradox). And also have posted about reasons for systemic reasons for medical studies presenting misleading results (Why Most Published Research Findings Are False, How to Deal with False Research Findings, Medical Study Integrity (or Lack Thereof), Surprising New Diabetes Data). This post collects some discussion on the topic from several blogs and studies. if vaccine were no better than placebo we would expect to see a difference as large or larger than the one seen in this trial only 4 in 100 times. This is distinctly different from saying that there is a 96% chance that this result is correct, which is how many people wrongly interpret such a p value. So, the modestly positive result found in the trial must be weighed against our prior belief that such a vaccine would fail. Had the vaccine been dramatically protective, giving us much stronger evidence of efficacy, our prior doubts would be more likely to give way in the face of high quality evidence of benefit. While the actual analysis the investigators decided to make primary would be completely appropriate had it been specified up front, it now suffers under the concern of showing marginal significance after three bites at the statistical apple; these three bites have to adversely affect our belief in the importance of that p value. And, it’s not so obvious why they would have reported this result rather than excluding those 7 patients from the per protocol analysis and making that the primary analysis; there might have been yet a fourth analysis that could have been reported had it shown that all important p value below 0.05. Trials often employ composite end points that, although they enable assessment of nonfatal events and improve trial efficiency and statistical precision, entail a number of shortcomings that can potentially undermine the scientific validity of the conclusions drawn from these trials. Finally, clinical trials often employ extensive subgroup analysis. However, lack of attention to proper methods can lead to chance findings that might misinform research and result in suboptimal practice.